It’s been a while since my last post, but it’s been chaotic around these parts. Our basement is finished! And our new tenants (/my brother-in-law’s family) has moved in. I managed to get a few pictures really quickly before they moved their stuff in, but getting it cleaned up was down to the wire! PS: husband did 99% of the work here. I am not trying to take disproportional credit.. 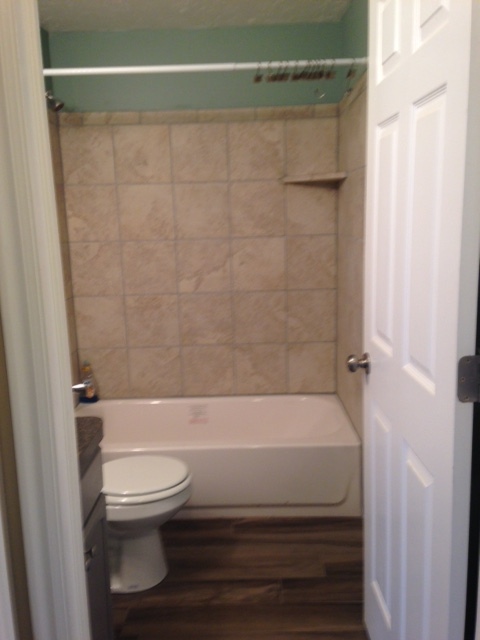 He framed it, drywalled, did the plumbing, electrical, tiling, flooring, heat ducts… he’s that talented. I helped with the design decisions and a few little things here and there (namely keeping myself and a curious toddler out of the way). 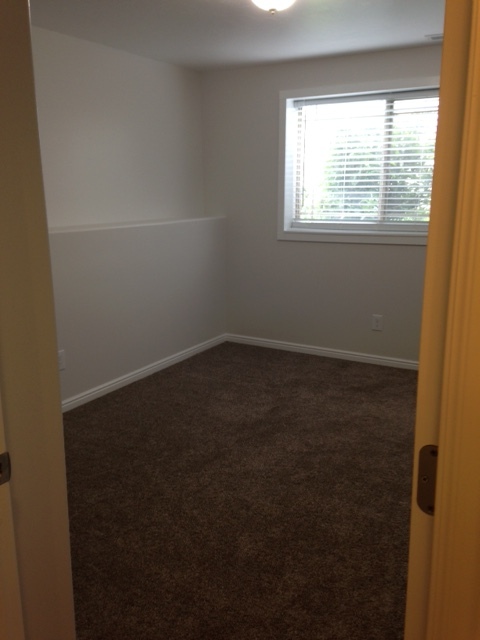 And we had two bedrooms carpeted professionally. Otherwise, it was pretty much all him! 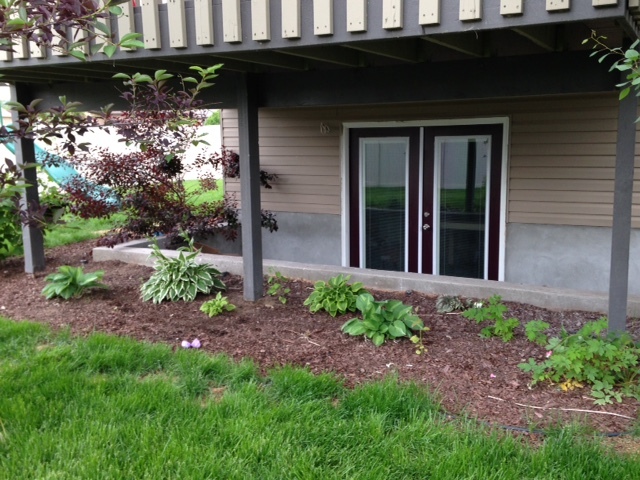 The entrance is through the walkout under the deck. Since snapping the photo Jonathan installed a light fixture. I still need to paint the door casing tan, but I did paint the door a fun eggplant purple last weekend. Also that shade garden is finally starting to fill in a little. I need to divide the hostas.. another thing to add to the summer to-do list. When you come in the door, you walk in to the family room area. The French doors went into a room that used to look like this. It will eventually be our office/craft room. Right now it’s being used as a master bedroom. 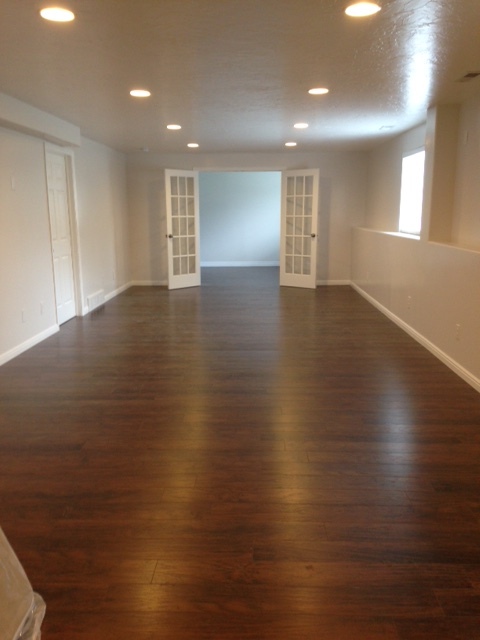 We installed Traffic Master wood laminate flooring in Hickory throughout this space and I think it looks great. It’s supposed to hold up well to kids and dogs so this will be a great test. 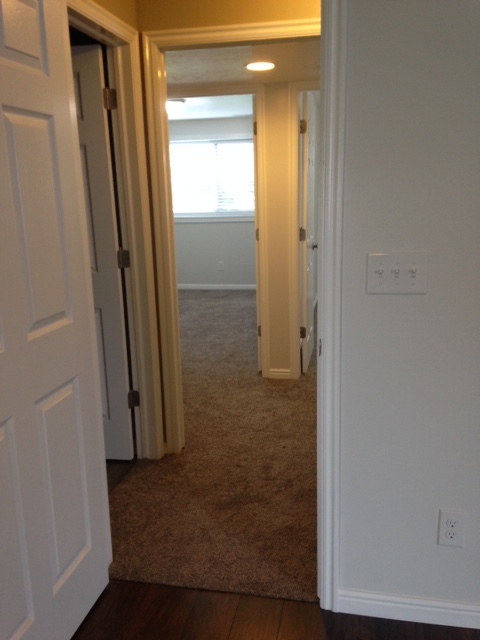 The walls are a light grey (Behr Swiss Cream). 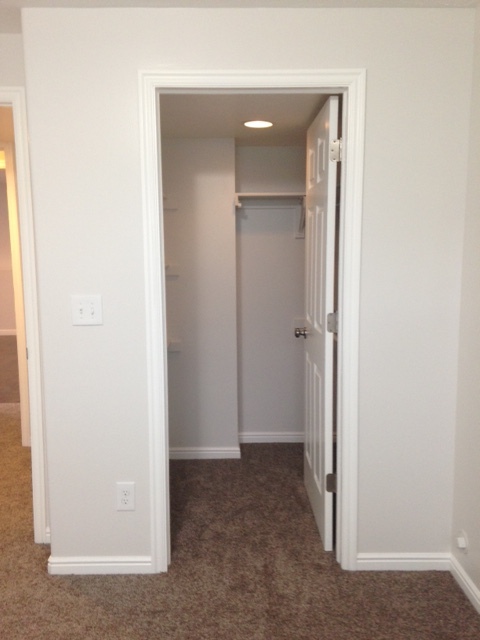 The door you see to the left is our storage room. It’s completely crammed full of stuff, currently..
Below is the little landing at the bottom of the stairs from the living area. The bathroom is to the left, the bedrooms straight ahead, and the staircase is to the right (to give you an idea of the layout). The bathroom is super cute! 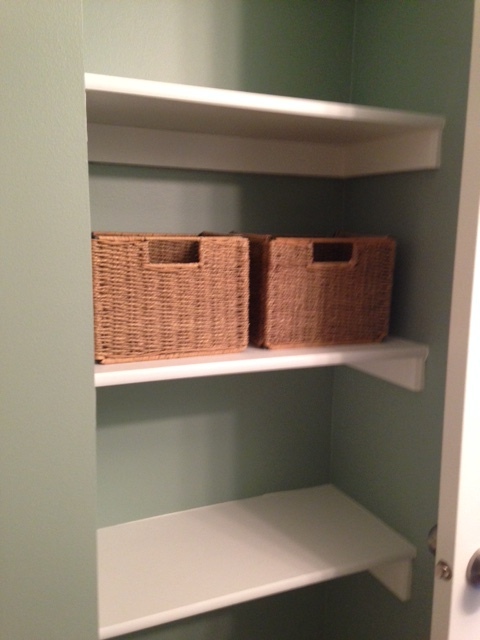 Jonathan built the cabinet, tiled the shower and flooring, and built a nice little nook for storage/laundry hampers. 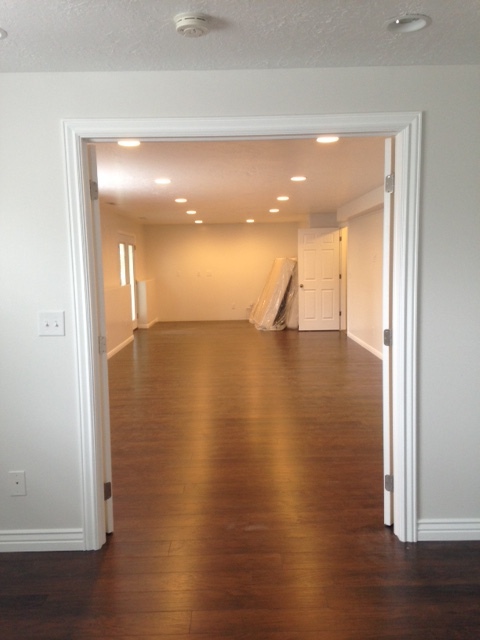 The flooring is tile that looks like wood and I LOVE it. The paint color is Behr Aqua Smoke (leftover from our bedroom re-paint last fall). The family living with us has three kids. The girls are sharing a room and the boy gets his own. 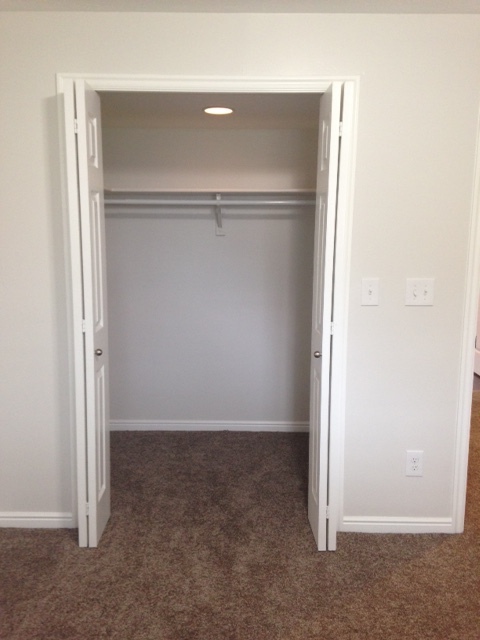 They are roomy and have nice big closets. 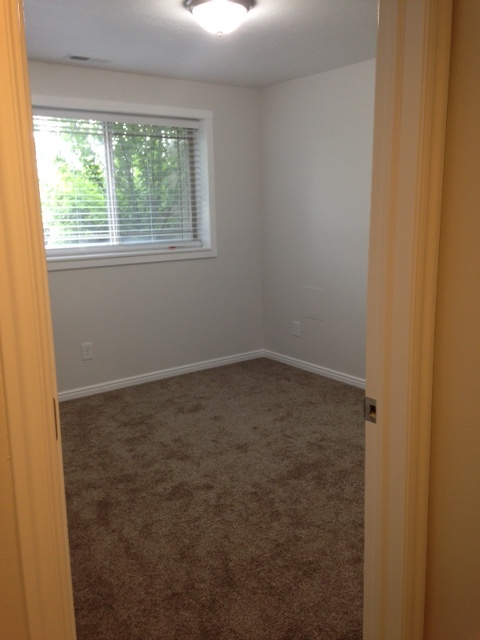 The carpeting is the same as our upper floor. (Phenix Lakefront in Iced Branches). Eventually we will be spreading out into this space ourselves and it seems hard to believe we will have so much room! 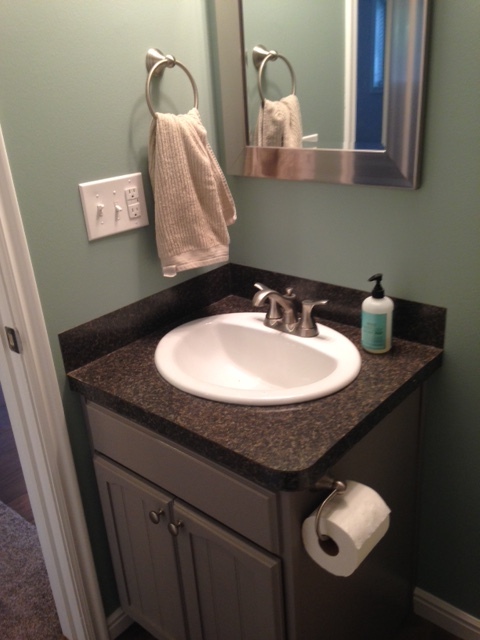 It was a DIY job, so very budget-conscious, and adds a lot of value to the house. I am really pleased with how it turned out!